My name is Georgia and, along with four other grandchildren and one daughter of Jean’s, we are taking part in the Light up the Night event in memory of our Grandma and Mum. Jean was diagnosed as terminally ill with cancer early last year and got taken in to the East Cheshire Hospice in September as her respite. Within her stay at the Hospice, Jean fell in love with the place, especially the staff and the food. 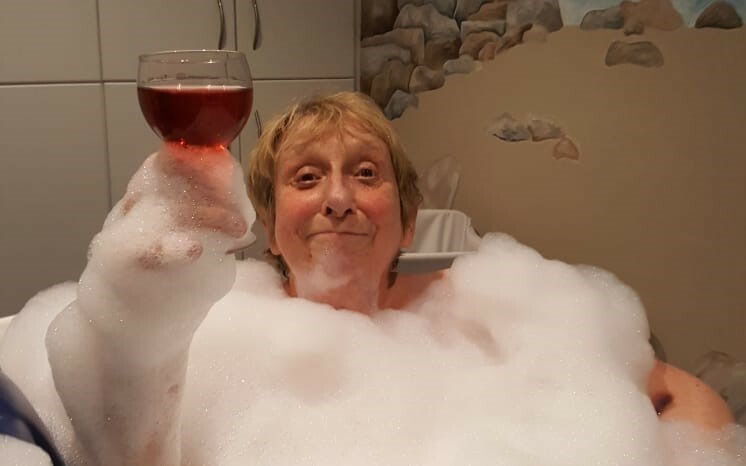 Jean also loved the Jacuzzi bath (with a cheeky glass of Vimto) and all the pampering which was given to her whilst she stayed at the Hospice. When visiting Jean, all of her loved ones saw how happy and vibrant she was because of the way the staff were looking after her. After being discharged, Jean continued to go to the Sunflower Centre at the Hospice every Tuesday and thoroughly enjoyed the painting, getting her hair done and going to Reiki therapy. The reason we have chosen to take part in this event is because we know how proud our Grandma/Mum would be of us for doing this and raising money for this very worthy cause. The way that the staff helped Jean was amazing and we want to do all we can to thank them so taking part in this event is a way for us to remember our Grandma/Mum but also raise money for the Hospice to help carry on the amazing care that they give to every patient in need. Thank you so much for choosing to support East Cheshire Hospice. You may never know how much your gift means, but we know that it will make the world of difference to our patients and their families.